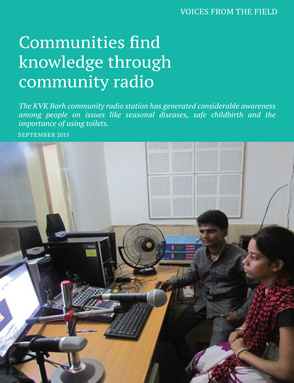 The KVK Barh community radio station has generated considerable awareness among people on issues like seasonal diseases, safe childbirth and the importance of using toilets. Community radio is the voice for voiceless, the repository of knowledge and science. Through community and their language, community radio provides solution to the social problems. This report gives insights on the SWASTH's experiences in sensitizing the community through this feature.